Nicole Narea and Clifton Wang of the Yale Daily News have written a preview of “The Wired City,” which is primarily about the life and times of the New Haven Independent, an innovative online-only nonprofit news site. We need to cut down on the information apartheid. If we are going to construct a paywall, we may as well not publish. We believe in community empowerment through journalism. Journal Register is currently in bankruptcy for the second time in four years, but is expected to re-emerge later this spring. No doubt it’s going to be painful — among other things, employees have been told they will have to reapply for their jobs, and it is far from clear how many will be rehired. The Newspaper Guild-Communications Workers of America recently had some tough words for Journal Register, reports Bill Shea of Crain’s Detroit Business. As Joshua Benton of the Nieman Journal Lab observed last September, the re-emergence from bankruptcy will also represent the best chance for Paton — one of the most closely watched executives in the newspaper business — to prove that a digital orientation can turn around a legacy newspaper chain with a lower-revenue, lower-cost approach. Interesting times ahead. Photo found at Newspaper Death Watch. Here is the slideshow I’m going to use in discussing “The Wired City” before a group of retired Northeastern alumni on Wednesday. I want to keep refining this, so advice is most definitely welcome. I’ll be doing my first book-related event this Wednesday at noon, when I will speak at Northeastern’s Burlington campus as part of the NU@Noon alumni series. 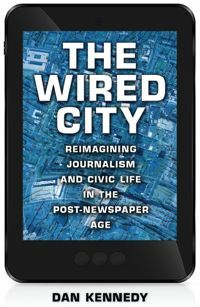 Review copies of “The Wired City” went out last week, and New Haven Register reporter Luther Turmelle has written a very kind preview.